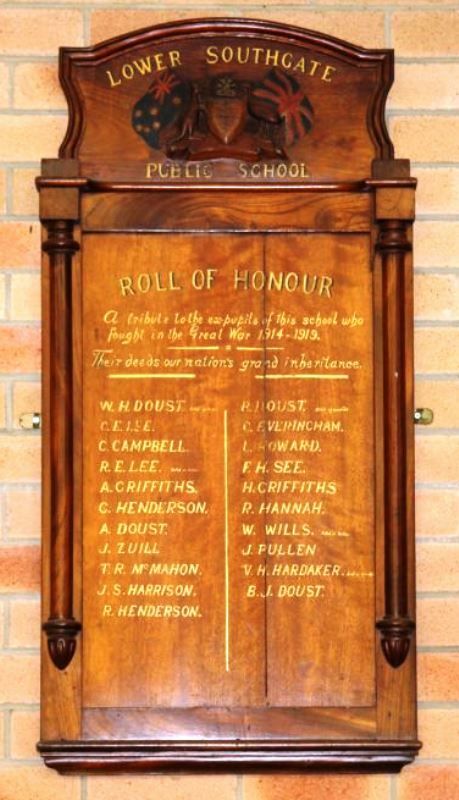 A wooden honour roll commemorates ex-pupils of the school who served in World War One. At Lower Southgate Public School last Saturday there was a very large gathering, the occasion being the unveiling of an honor board on which is recorded the names of 17 soldiers who have been pupils of the school. The board is a beautiful piece of workmanship, planned and made by the teacher, Mr. J. Sheppard and is certainly a credit to him. It is made from Queensland maple, also cedar and rosewood, both grown at Lower Southgate. Over the board is a canopy artistically made, and bearing the Australian coat of arms, and on each side a flag, the Union Jack and the Australian flag. Above the board is written: 'A tribute of love to the ex pupils who fought in the great war, 1914 to 19 — ." Above the names is the motto, "Their deeds our nation's great inheritance. " Daily Examiner (Grafton, NSW), 25 April 1918. Their deeds our nation`s great inheritance.